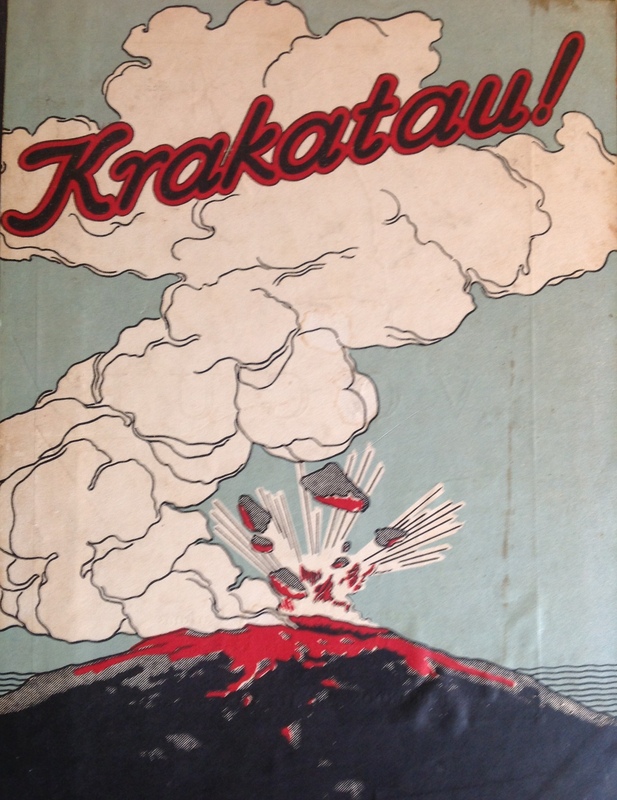 Magazine cover from 1928, from a photo gallery of the renewed eruptions of Anak Krakatau, Java. Photo: David Pyle. Krakatau, or Krakatoa, is synonymous with catastrophe. The huge eruption of Krakatau in August 1883 was one of the first global media events, as news reports travelled around the world on the newly installed deep-sea telegraph cables. The eruption also led to many new scientific discoveries, as observations of atmospheric phenomena were reported from around the world, including vivid sunsets, Bishop’s rings and noctilucent clouds, all associated with the fine haze of volcanic sulphur compounds that were injected into the atmosphere by the eruption. Krakatau is a major caldera volcano, that lies in the sea to the west of Java, Indonesia. It is one of the many active volcanoes of the Sunda Arc, which is forming as a result of the subduction of the Australian plate beneath the Sunda plate. Krakatau is not the only volcano of this chain to have erupted with devastating consequences. Toba, to the north, was responsible for the largest known eruption of the past 100,000 years; while Tambora and Rinjani, to the south east, had major eruptions in 1815 and 1257, both of which may have had global consequences. How does Krakatau stack up as a Top Trumps Volcano? Explosivity (Volcanic Explosivity Index) – 6. The 1883 eruption of Krakatau was one of the largest of the past 200 years. Height – 813 m. The highest remnant of what had been a spectacular volcanic cone, until August 1883. Deadliness. 1000. The 1883 eruption was one of the deadliest on record – with many tens of thousands of people killed both by the hot pyroclastic flows, that rushed off the flanks of the collapsing volcano, and skittered across the sea, causing havoc for people living along the nearby coastline; and also by the huge tsunamis that were triggered as the volcano collapsed into the emptying magma chamber, forming a huge flooded caldera. Wow factor – 66. This score might well have been higher before 1883.. but what remains of the volcano from that eruption is now mainly underwater. Unpredictability – 33. Krakatau is now settled into a fairly regular pattern of small to moderate eruptions, and this will most likely continue for the foreseeable future. Devastation Potential – 150. Krakatau burst back into life in the 1920’s, and the cone of Anak Krakatau is now a very prominent feature, rising over 300 m above sea level. Destructive caldera-forming eruptions, like that of 1883, usually take many thousands of years to repeat, so the current ‘devastation potential’ is relatively low. Fun fact – One of the many disaster movies about volcanoes is ‘Krakatoa, East of Java‘, released in 1969. As well as mis-spelling the name of the volcano, Krakatau is, of course, west of Java! There are many online resources about Krakatau and the 1883 eruption. Here are some of our favourites: a piece by David Bressan for the Scientific American Blog; another by Bill McGuire for the OUP Blog, and Jeremy Plester’s Weatherwatch piece for The Guardian.